We looked at all our ukulele charts and recommendations, including this main top ten list encompassing some of the best ukes on the market today. We removed a few dated models, such as the Lanikai TunaUke SMTU-C and Fender Nohea, and replaced them with the awesome Lanikai QM-BLCEC, the well-balanced Kala KA-SBG, and the super-cool Fender Montecito. What is a Good Ukulele? Which Brand of Ukulele is The Best? Should I Buy an Electro-Acoustic Ukulele? Looking for a new ukulele? Whether you’ve been enchanted by the sweet Hawaiian beach tones, or attracted by the playability and portability, you’ve come to the right place – we’re crazy on ukes here at GuitarFella! Since it was developed in Portugal in the late 19th Century, the ukulele has grown in popularity, although it’s recently seen a bit of a renaissance, and these daysis one of the coolest instruments to be seen with. While it’s perfect for everyone from children and beginners to experienced performers, there’s lots questions you can ask when looking for the best ukulele – which are the brands, what are the sizes, what should you look out for, and how much to spend? To help you narrow in on the perfect uke for you, we’ve compiled a chart of some of the top ukuleles to suit any budget– from affordable beauties to premium players from some of the best known uke brands including Lanikai, Cordoba, Kala, and Luna. Below the chart, you can check out our complete guide to the ukulele – learn everything you need to know to help you make an informed decision. Note that, in the chart, we will highlight the size of uke (concert, soprano, tenor or baritone), although you will usually be able to find an alternative size of the same model elsewhere on the market. For the sake of simplicity, we also only focus on four-stringed models. A fantastic concert uke, inspired by the sea! Classic style and tone from a beautiful tenor. Undoubtedly one of the best-looking ukes on this list. Fender’s brand-new tenor uke – inspired by celebrity homes! Ibanez add their own twist to this excellent concert uke. Pacific Walnut gives this affordable uke its unique look. A perfect electric travel uke for under $100! So much value on offer with this incredible bundle. Great uke, great price, great bundle! Any ukulele sitting at the top of our chart must offer excellent sound, style and playability, while having that wow factor. The Lanikai QM-BLCEC is a worthy ukulele indeed! Part of Lanikai’s ‘Sun, Sand and Surf’ series, the QM-BLCEC uses a striking blue-stained quilted maple for the entire body, with great decoration and attention-to-detail, ensuring this higher-priced uke has a higher-end feel. It also has plenty to boast about in the hardware department, with an all-round solid Fishman Kula preamp system with 3-band EQ and a convenient built-in digital tuner. Throw in great tuners, no-tie bridge and case, and you have a real winner. Our full breakdown of the Lanikai QM-BLCEC gives you everything you need to know! Looking for a ukulele with huge quality, style and tone? Cordoba is usually the brand to deliver, as this 32T from their higher-end 30 Series proves. Using traditional Spanish building methods, this uke features a tenor body, made with solid Sitka spruce on the top and solid Indian rosewood on the back and sides. There’s also a premium-feeling mahogany neck, with a rosewood fretboard, 18 frets and slightly wider nut width, which is great for players with larger hands. Sound-wise it’s excellent, and projects very nicely. Another plus point isthat it comes with a top-notch Cordoba polyfoam case for storage and protection when travelling. Our full review of the Cordoba 32T gives you all the information you need to know. After our most recent chart reshuffle, there’s still only room for one baritone ukulele on our list – and it’s a great one from Kala! The formidable ukulele brand uses a mix of quality woods, elegant design, and adept craftsmanship to produce a baritone worthy of anybody’s time – especially at under $300. With a 30.5” baritone body, the KA-SBG is made using the classic pairing of solid spruce on the top and laminate mahogany on the back and sides. As we explain in the full KA-SBG review, there’s a well-balanced and powerful sound from this big beauty, which will get even better with time, while the tone and playability is complemented by the solid hardware. For an instrument with the wow factor, you usually don’t have to look much further than Luna Guitars, who specialize in producing beautifully-designed instruments worth admiring. 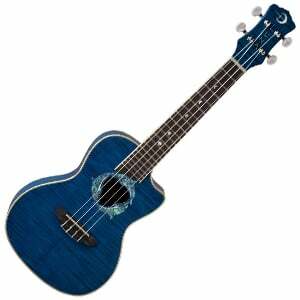 Their Dolphin concert ukulele is certainly one of these, with an aquatic theme that ticks all the boxes. Giving the illusion of waves is the trans-azure finished flamed maple top, that sits on a laminated maple body, with a trio of dolphins making up the striking soundhole rosette –overall a gorgeous design. There’s great playability and the naturally bright tone can be amplified nicely via the fitted Luna UK-T2 preamp and pickup system, with volume and 2-band EQ controls – as we highlight in the full review of Luna’s Dolphin. New to our chart for 2018 is a delightful Fender ukulele – the Montecito. Come on, you could tell it was a Fender, right? Just look at that iconic Telecaster headstock! However, the Montecito is thoroughly ukulele in its build, playability and tone. The full-size tenor body is made entirely from koa (solid on the top, laminated back and sides), with a very playable glossy nato neck, a rosewood fretboard and 19 frets. There is no pickup or preamp on this uke, but the acoustic sound is well-balanced and should grow in tone as the solid wood ages. For the price, there’s plenty of value with the Montecito – as we highlight in the full review. Just like the Fender Nohea above, this Ibanez ukulele sports a little rock n’ roll attitude, while delivering everything a concert ukulele needs. This sub-$200 ukulele offers great value – in fact, it’s hard to fault. Featuring Ibanez’s EW Series shape, there’s a concert-size body which looks great in an open-pore flamed mahogany, along with some nice detailing and binding across the uke. It’s lovely to play, with the mahogany neck feeling sleek and fast in the hands – as you’d expect from an Ibanez instrument. As we mention in the full review of the Ibanez UEW15E, the electronics are also pretty good for the price, with Ibanez’s UK300-T pickup and preamp, featuring 2-band EQ controls and a built-in tuner. The first soprano ukulele on our chart, and another which falls into the sub-$200 category –although it looks like it could be priced much higher. The KA-PWS features a body made entirely from Pacific Walnut, with a super grain and elegant detailing – the black binding and satin finish in particular enhance the look further. The hand-feel is great, with a mahogany neck, a rosewood or walnut fretboard, and 12 frets, all in the clear. For a more affordable instrument, the craftsmanship is great, while the tone on offer is bright and clear – everything you’d want from a soprano uke. All the details you need can be found in the full review of Kala’s KA-PWS. Unique? Yes. Travel-friendly? Yes. Affordable? Oh yes! At under $100, the Electric Peanut from EleUke is one of those that instantly feels underpriced. It’s definitely a bit of a wildcard, with a peanut-shaped concert-size body made of solid, satin-finished mahogany. However, it’s light and comfortable to hold, and offers a full-size mahogany neck with 13 frets. As the full review of the Electric Peanut confirms, this uke features a piezo pickup and preamp for easy headphone playing, while there’s also Bluetooth connectivity allowing you to easily hook up to a smartphone. The Peanut is robust and durable enough for travel, and includes a nylon gig bag – great value for under a hundred bucks. The first of two bundles on this list is one that offers incredible value and is very much targeted at beginners. The kit offers everything you need to get started with – and master –the ukulele. However, the ukulele itself is also great, and worth the price tag alone. It’s an attractive full-size concert model, made entirely from laminated Sapele, with a rosewood fretboard and 18 frets. The rest of the package includes a brilliant protective case, a clip-ondigital tuner, a strap, felt plectrums and spare strings, not to mention a few cool extras. As we highlight in the complete Bondi Bundle review, this kit includes lots of instructional material too, including a free Skype ukulele lesson. For beginners, it’s hard to go wrong with this exceptional package from Lohanu – offering pretty much everything you need to get up and running on the ukulele. 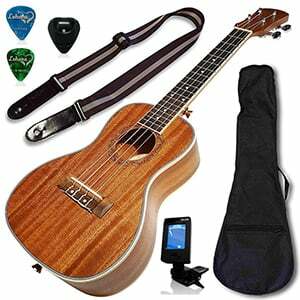 The main attraction of this bundle is a lovely laminated Sapele-bodied ukulele, with either a soprano, concert or tenor size. It’s an attractive and highly playable ukulele, with a nice grain and protective ABS binding. It also sounds great, and the arched back helps with the projection. Aside from the ukulele, this kit comes with a nice, padded Lohanu gigbag, a strap, a clip-on digital tuner, plectrums and even an extra set of Aquila strings. Want all the info on the Lohanu Ukulele Bundle? Check out the full review here. Remember that the chart above is certainly not a comprehensive list – there are hundreds of quality ukes out there. However, our selections offer a good taste of what’s hot in the current market, across all price ranges. If you walk away with any of the ukes on the list above, you’d have made a decent choice. On the face of it, we can tell why someone may confuse a ukulele for being a miniature guitar. In fact, the general anatomy of a ukulele will be very familiar to anyone who has played a guitar. Whatever size uke, the instrument will feature a body, a neck, a fretboard, a headstock, as well as a nut, bridge, saddle, strings and tuners. Like a guitar, a uke will sometimes include electronics, in the shape of an undersaddle pickup and a preamp with various volume and tone controls. However, there are more differences similarities. Firstly – in most cases – a ukulele will have just four strings, compared to the six you’d find on a typical guitar. They will also have less frets. From soprano to baritone, you may find anywhere between 12 and 21 frets – much less than standard guitars, which will generally have between 19 and 24 frets. Ultimately this means that ukuleles are slightly easier to learn and play than guitars, and require less pressure to play due to the lower string tension – so they are brilliant for beginner. Another key difference is that ukuleles sound much brighter and happier than a guitar. Of course, a tinkly soprano uke will sound different to a deeper tenor uke, but all have a sound that’s easily distinguished from a guitar. This is half down to the size of a uke compared to a guitar, but also because they are tuned differently (typically G-C-E-A, although a baritone ukulele is the exception). Finally, be aware that a ukulele will usually cost less than a guitar. Obviously, it’s not always the case, but you will find that generally a decent entry-level uke may cost $40, whereas a decent entry-level guitar would be nearer $100. At the higher end, $500 would get you a great uke, but you may need to spend double that to pick up a guitar with similar woods, tone, craftsmanship and electronics. A good ukulele is one that can be made by pretty much any established brand, can be any size, and can come from a wide range of price categories, providing it shows a few important characteristics. One of the most important of these characteristics is the tone of the uke. While tone is very subjective, a good ukulele will be bright, crisp, focused and happy – it’s what a ukulele should sound like. Of course, a baritone ukulele will sound a lot deeper and mellower than a soprano, but you can tell the quality of a uke quite quickly by listening to its one. The playability of a ukulele will also be a big factor in determining whether or not it is any good. You want something that feels solid to hold, smooth to play, shows no rough spots and has nicely dressed frets (i.e. no sharp edges). Ultimately, providing the ukulele is made of wood (not plastic) and comes from a reputable brand, you can be assured it is pretty good, regardless of how little it costs. As we have just noted, a good ukulele can cost very little. Don’t be surprised to find a very good ukulele coming in at between $50 and $100. Having said that, some ukulele players will define ‘good’ as a ukulele that rises above the entry-level/beginners category. Perhaps a model with a more refined tone that would work well for solo or group performances as well as recording. We are not talking about a high-end ukulele, but something solid that feel like a quality instrument – perhaps showing off a unique style, better projection and upgraded components. For a good uke such as this, anywhere between around $200 and $300 is the sweet spot. We arrive at another tricky question as these days so many brands offer quality ukuleles at a range of prices. Some brands are new and aren’t well-established, while others have been going for decades. Some companies – such as Kala and Lanikai – focus primarily on ukuleles. By specializing in the uke, they have become very experienced and always produce a good instrument, regardless of the price tag. Other brands, such as Fender and Cordoba, also produce some of the best ukuleles on the market. Although they mainly specialize in guitars, the companies are so big that they can dedicate a lot of time and manpower to developing a great ukulele. Finally, the American brand Luna, who also make acoustic guitars, specialize in attractive ukuleles with unique finishes, so they are worth checking out if the aesthetics of a ukulele is important to you. Browsing this article and chart, you will have gathered that there are four primary ukulele sizes: soprano, concert, tenor, and baritone. You can find others, such as the miniature pocket ukes as well as hefty contrabass ukuleles, but the four sizes listed above are the most popular and, as such, the main focus of both the current market and our charts. 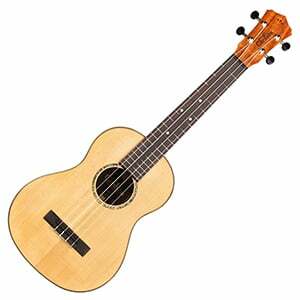 Of the popular sizes, the soprano ukulele is the smallest – and usually the size you’d associate with the ukulele. A soprano has a typical length of around 21”, with 12 to 15 frets, and the standard ukulele tuning of G-C-E-A. It produces the classical ukulele tone – vibrant, bright and happy! It’s great for children due to the smaller size, although adults can certainly find as much enjoyment with a soprano. Another small ukulele, although slightly bigger than a soprano, is the concert ukulele. You’ll usually find a length of around 23”, with 15 to 18 frets, and the familiar G-C-E-A tuning. While a concert uke still offers a bright sound, it’s a little louder and richer than a soprano. It’s also excellent for beginners, as there’s a little more space to maneuver, while remaining compact. A tenor ukulele is bigger again – generally featuring a length of around 26”, with between 17 and 19 frets, and that traditional ukulele tuning of G-C-E-A. The larger size means that the sound is slightly deeper and fuller, and projects very well. It’s a great stage performer, and another uke that’s excellent for adult beginners due to the bigger fretboard. As you may have guessed by now, a baritone ukulele is the biggest of the popular sizes, with a typical length of 29”, and around 18 to 21 frets. The tuning is the same as the highest four strings of a guitar: D-G-B-E. While a baritone is less suitable for ukulele beginners, it’s great for guitarists who will be familiar with the tuning and setup. Sound-wise, a baritone provides a deeper, louder ukulele experience. We’ve talked a lot about ukuleles, but you may have stumbled across a banjolele on your search for the perfect uke. Despite sharing a lot of similar features, they are different instruments. They utilize a similar scale and neck to a ukulele – as well as the same G-C-E-A tuning – but with the body and vibrating head of a banjo. The result? A unique, cheerful tone that’s a little more vintage in its sound than a standard uke. Listen to some George Formby and you’ll get the idea! You can read more about banjoleles and our recommendations in our guide to the best banjoleles. In the ukulele market you can find a great uke for both $50 and $500 – although there will be huge differences in quality. Let’s briefly touch upon a few of these. Brands making a cheap ukulele are more likely to use laminated wood in the body construction, as opposed to solid wood, which can offer a bigger sound with more character. This isn’t always the case, as some higher-end models can utilize laminates, but generally a $500 uke will be made of solid wood. The craftsmanship on a high-end ukulele will also be much better than something in the budget market, and will come out of the box feeling as smooth as butter, with no rough spots, sharp frets or suspect electronics. Again though, some cheaper models do show off good craftsmanship, despite being mass produced. You’ll also find that higher-priced ukuleles come with more advanced electronics, which deliver clearer, more natural sounds, with more versatile EQ controls, while you may also find some innovative features – such as Lanikai’s TunaUke system, which allows for individual string intonation adjustments. Finally, while the tone of any ukulele is subjective, it’s pretty much guaranteed that a higher-end uke – thanks to its quality solid woods, construction and electronics – will offer a sound with more complexity, character and projection, when compared to an all-laminate budget model. It depends on your aspirations – where are you taking your ukulele? If, like many players, you dream of playing the uke on a Hawaiian beach around a campfire for a small group of friends (that is the ukulele dream, isn’t it? ), then you are unlikely to need electronics. Same goes if you are more of a bedroom player, or are travelling around, or are a complete beginner – while electronics may seem cool, when you’re just starting out they provide little more than a distraction. If you are buying a ukulele that is destined for stage performances, then electronics are suddenly a better idea, allowing you to easily plug into an amplifier. This is also the case if you are planning to record with your uke, as you can easily hook up to recording systems. When it comes to electronics, you can actually find some decent electro-acoustic ukes in the budget ukulele category, although the more you spend, the better quality of pickup and more versatile the preamp system. However, each brand and model varies so much, there’s no one-size-fits-all when it comes to ukulele electronics. Buying used is always a risk – although it certainly has its advantages. For example, providing you can get over the fact that it’s not going to be ‘box fresh’, you can find a more expensive ukulele for anything up to half the original price. So, if you are considering a high-end ukulele, buying used could work out very cost-effective. However, if you are looking at a budget uke or something with a lower price tag, buying new is usually your best option, unless you are on a super-tight budget. You will guarantee a quality ukulele with no wear and tear, damage, or problems with electronics. Plus, you have the security of a returns and refund policy, if buying from a reputable online marketplace (such as Amazon or Guitar Center) or a trusted local guitar store. If you are going the used route, make sure you are able to test the ukulele thoroughly before buying, especially if it has electronics. And make sure you are aware of the returns policy of wherever you are buying the instrument. Buying a ukulele is a fantastic experience, although it’s just the start of a long and entertaining journey to becoming a great ukulelist. When buying a uke in whatever price range, make sure you take your time over the decision. Compile a little shortlist of your favorite models, read reviews, watch videos and test them out, if possible. Whether you’re a complete beginner or an experienced player, we hope you’ve found the chart and guide useful in the hunt for your ideal ukulele.